We use PXE & Puppet to do backup and restore servers and fast deploy bare metal with clonezilla. After reading Citrix Olympus porject and DELL bootstrapping white paper. 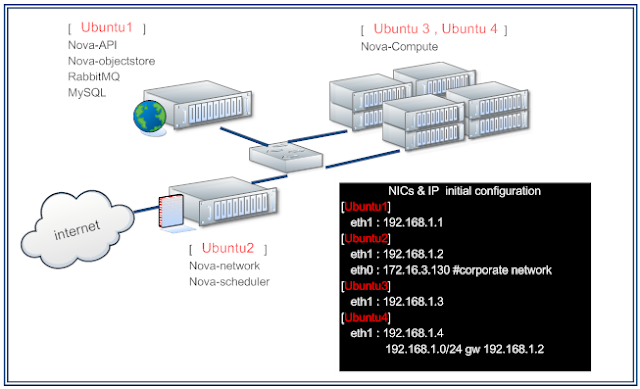 I'm sure PXE & Puppet is a good approcah to deply openstack nova. As Dell said , the administration Server is a core part for both managing and monitoring NOVA services. In Citrix Olympus , depends on XenServer it's really fast to hold a cloud infra. But it's a commercial solution. Take a look at DELL . The consideration is different from my mind. I still want to find a way of HA+LB nova-network service until read the doc which is written by DELL. And Olympus is a commercial solution with Xen. DELL , It's concept attract my interesting. It mentions some important points for large scale environment. Both of these are useful for design your own cloud infra. Sorry for my poor knowledge. Current Citrix Olympus is almost the best solution of a "private" cloud of OpenStack. But you have to pay for it. And DELL's architecture looks like a good solution of large scale environment. There're some of my idea. Any idea will be helpful. I'm trying to make it works recently.